On Saturday I was helping a friend by riding her new motorcycle home for her. The guys at the shop asked me if I was going to Rocker Box. "Huh? ", says I, brilliantly. They explained that it was a big rally event in Milwaukee, WI. 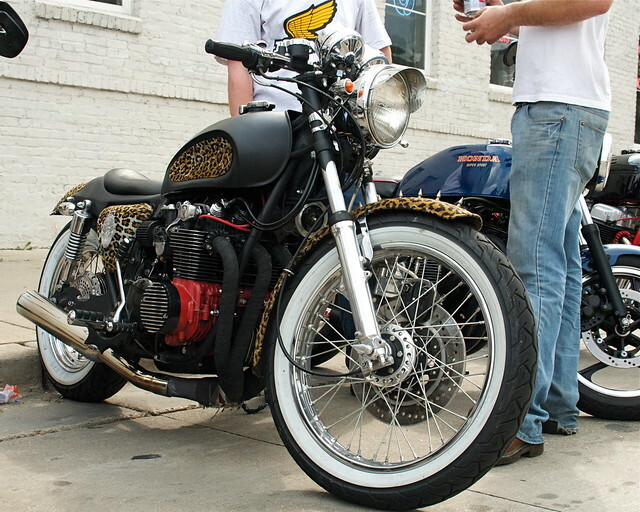 Supposedly cafe bikes and other customs were the focus, and people brought their cool bikes out to see and be seen. I'm glad I made the 150-mile round trip. There were, in fact, quite a few cool bikes to look at, as well as a swap meet tailored to cafe bikes and bobbers rather than the usual Harley scene. To be sure, there were H-D's in attendance, but if there was any bike that stood out, was ubiquitous, it was the Honda CB four-cylinder in all it's displacement variations: 350, 400, 550, and 750. Cafe treatment, or bobber, but seldom stock. 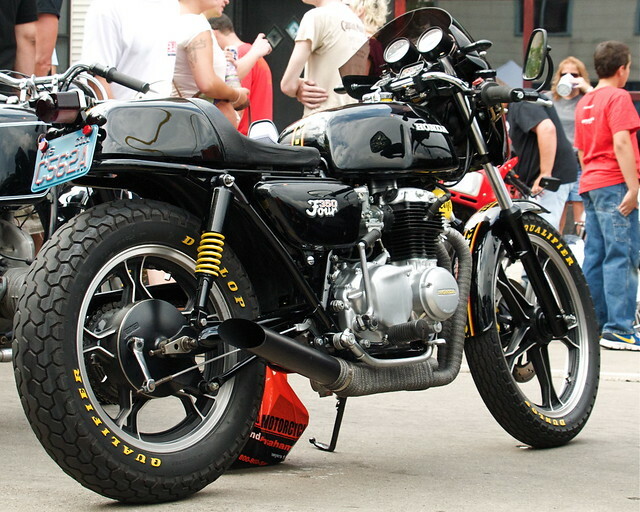 This lovely Honda 350 Four cafe racer was my favorite of the day I think. There were hundreds to look at, and I shot maybe twenty. There is a SLIDE SHOW if you care to look at more. All the crops are tight because there were a lot of bikes and a lot of people. A fun day! My favs were the rat bikes-- because they are mostly an artistic statement-- and the bikes that were only slightly more than bicycles.